Receiving brand new Porsche 911 GT3 R race cars only one week prior to the first event of the 2016 Pirelli World Challenge (PWC) season, EFFORT Racing quickly prepared a fast race car for Michael Lewis and his teammate Patrick Long. Austin, Texas — Michael Lewis began the 2016 Pirelli World Challenge (PWC) season at the front of the 33-car field and earned a respectable 7th in the series’ first race at Circuit of The Americas (COTA) in Austin, Texas. After taking possession of two brand new race cars direct from Germany, the EFFORT Racing team, with Michael Lewis at the helm of the No. 41 EFFORT Racing/Curb-Agajanian Porsche 911 GT3 R, quickly showed the race car’s competitiveness. During the very first practice of the 2016 Pirelli World Challenge season on Friday, March 4, Michael set the second fastest time in practice at 2:05.702, just behind his EFFORT Racing teammate, Patrick Long, who posted a time of 2:05.574. They were two of only three drivers who broke the 2:05 mark during practice. 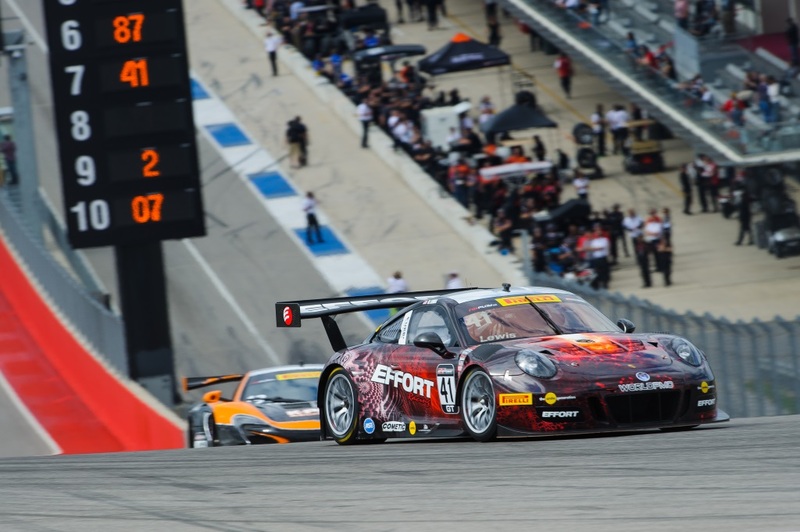 Michael Lewis made a strong showing at Circuit of The Americas for the PWC series opener by setting the second fastest time in practice and qualifying 9th of 33 cars. Qualifying for Race 1 took place Saturday morning with Michael running 9th fastest in a field of 33 cars, setting a time of 2:05.428. Michael placed the No. 41 EFFORT Racing Porsche in 9th position on the starting grid for Saturday afternoon’s race. The green flag waved for the rolling start where Michael lost one position on the first lap. A caution flag soon appeared on the first lap due to contact among some of the competitors. The race went green again on lap 5 and after some chaos leading into the first turn, Michael made a major move of the race when he passed five cars to improve up to 5th position. As the race progressed under green, he eventually lost two positions and finished in 7th, still earning a Top-7 finish. Michael’s teammate Patrick Long claimed the win for EFFORT Racing. As the PWC field battled for positions throughout Race 1, Michael Lewis drove a clean race and brought the No. 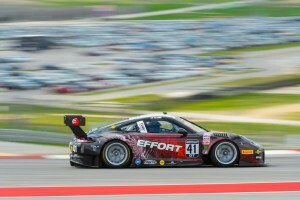 41 EFFORT Racing/Curb-Agajanian Porsche 911 GT3 R to the finish line in 7th place. For the second race on Sunday, March 6, Michael started in 7th position after setting the 7th fastest time of Race 1. As the race began, unfortunately, Michael’s teammate, who started in 2nd place, was hit from behind, which caused him to go off the track and make contact with the outside barrier. Although the No. 31 car sustained damage to end its race, Patrick was able to climb out under his own power, showing the extensive safety features incorporated into the car. When the caution period ended a few laps later, Michael made a move outside of the competitors in front of him. As he battled for position among several cars, his No. 41 made slight contact with another racer, which propelled his car off course into a spin. Michael was able to recover, but he was at the back of the field. Knowing he had a fast car under him, Michael immediately started setting fast times allowing him to move through the field, ending the race in 20th position. 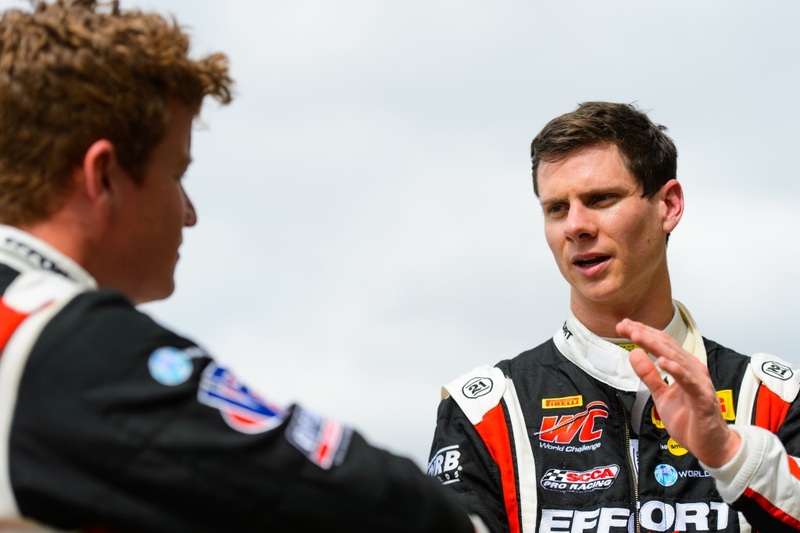 Michael Lewis discusses race strategy with EFFORT Racing teammate Patrick Long. To watch Rounds 1 and 2, CBS Sports Network will broadcast the races on Sunday, March 13, at 10:30 a.m. ET / 7:30 a.m. PT. Michael and the EFFORT Racing team will participate in the next two rounds of the PWC, March 11–13, at the Grand Prix of St. Petersburg, in Florida. This entry was posted in News on March 7, 2016 .